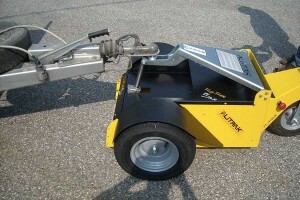 The TT-Plus is a pedestrian operated electric tug specifically designed for moving trailers. 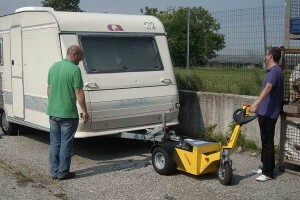 The TT-Plus couples to the trailers on the rear hitch through an electric lift with a 15 cm range eliminating the need to lift the trailer onto the ball mount. 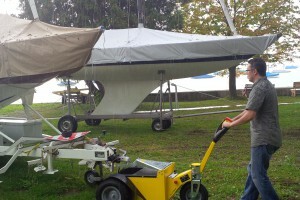 This greatly reduces the risk of injury to the back or the hands of the operator. 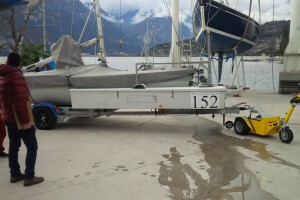 The power of the TT-Plus allows for a loaded capacity of 300 kgs and a pulling capacity of up to 3000 kgs. The TT-Plus is equipped with a swivel tiller head that can rotate 80° for maneuverability and has a forward and reverse speed up to 5 kmh. 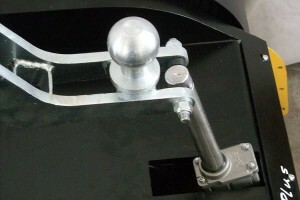 The TT-Plus has an electromagnetic brake that blocks the movement when not in operation, preventing slippage while on an inclined ramp.